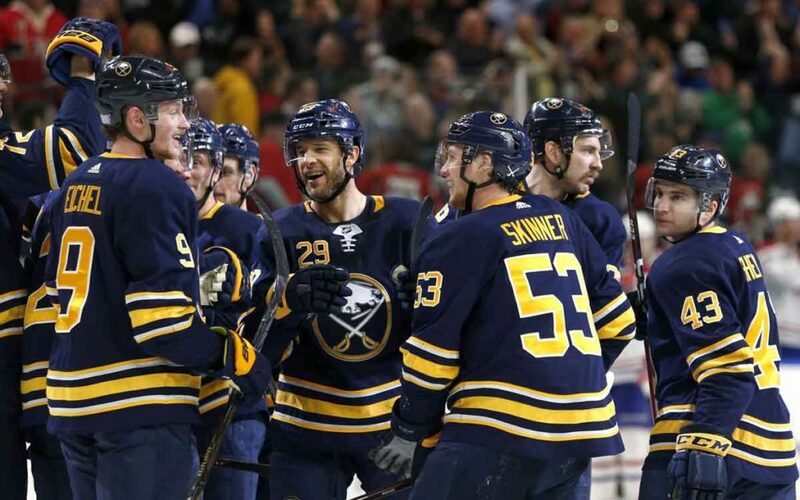 The Buffalo Sabres are off to a shockingly great start to the NHL season. Not a single person could have predicted this. From worst to first, started from the bottom – however you want to word it – the Buffalo Sabres are for real. In fact, according to the Elias Sports Bureau the Sabres are the first team ever to finish the previous season with the worst record and then lead the National Hockey League outright in points after 25 games. First and foremost, it starts in goal with Carter Hutton. Hutton has played like a number one goaltender, and his leadership off the ice has definitely made a difference in the Buffalo dressing room. Hutton was acquired via free agency in the off-season from the St. Louis Blues. Entering play Thursday, the Thunder Bay, Ontario native sported a (12-6-1) record with a 2.50 goals against average and .920 save percentage. And the combination of Hutton and rookie Linus Ulmark are a perfect (3-0) in shootouts this season. Over the past three seasons Buffalo goaltenders were a combined (5-15) in shootouts. When you work your way out from the goal you can’t overlook the play of 2018 first overall pick, Rasmus Dahlin. The Super Swede, as some refer to him, is playing with the composure of an NHL veteran and is not only the league’s top scoring defenceman, but is also tops in assists and plus-minus. Last but definitely not least, is the trade by Sabres general manager Jason Botterill to acquire Jeff Skinner from the Carolina Hurricanes. To say the trade is paying massive dividends might even be an understatement. Skinner is on pace for over 60 goals this season. His career high entering this campaign was 37 during the 2016-17 season. Hutton, Dahlin and Skinner are all newcomers this season and their presence has changed what many so-called insiders said was a toxic dressing room. Gone are Evander Kane (San Jose Sharks) and Ryan O’Reilly (St. Louis Blues). Not only is O’Reilly gone but the return Botterill got from the Blues for the veteran centerman bodes well for the present and future of the Buffalo Sabres. Botterill acquired two draft picks, including a first-rounder in 2019, and three forwards – Patrick Berglund, Vladimir Sobotka, and Tage Thompson – all of whom are on the current Sabres squad. “Everyone feels like we can’t lose,” said Rasmus Ristolainen earlier this week after scoring in a 3-2 overtime win against San Jose, giving Buffalo a 10-game win streak. So whether it’s confidence or culture, the Buffalo Sabres are back, and fans from across the Niagara Region and beyond are flocking once again to Key Bank Center.